The Albany Sonic Arts Collective presents Ben Miller, Holland Hopson, Barn Owl and Claymation. 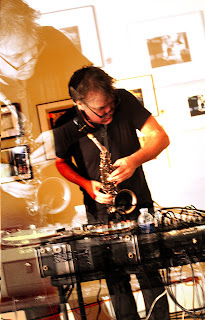 Ben Miller – alto sax, tapes, the zoo, voice and projection in support of a new release on Living Records. Ben has performed at ASAC a few other times, and was formerly a member of Destroy All Monsters, Sproton Layer, and other units. He’s one of the best out there, and you shouldn’t miss this performance. Barn Owl – amazing trio of improvising musicians extraordinaire. Matt Weston on drums/percussion, Andy Crespo on bass, and Chris Cooper on prepare guitar/electronics. You’re always in for a treat with these guys. Claymation – solo electric guitar improvisation from C. Baird Buchanan. We’re excited to have Baird bring his solo project to ASAC for the first time.